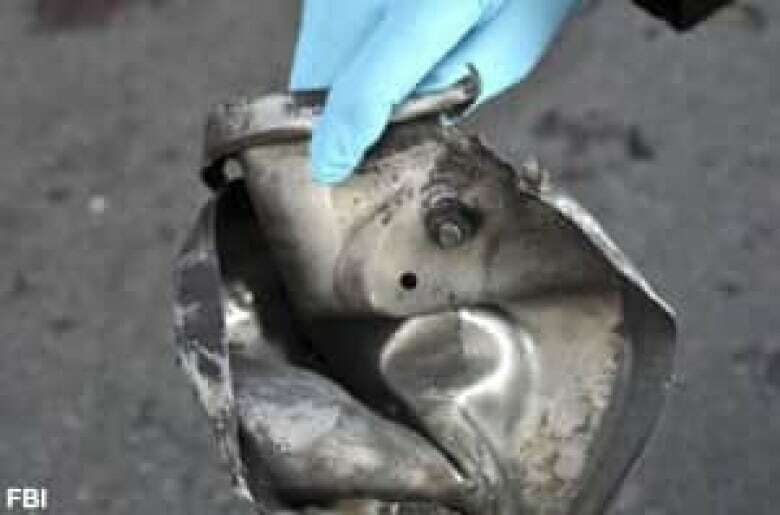 Pressure cooker bombs have been used worldwide, with instructions available online and easily found through internet searches. The remains of what may have been a pressure cooker were found at the scene of one of the two explosions Monday at the Boston Marathon, according to the FBI. Pressure cooker bombs have been used worldwide, with instructions readily available online and easily found through internet searches. Instructions on how to make such a bomb were featured in the first issue of al-Qaeda's English-language magazine under the headline, "Make a bomb in the kitchen of your mom." In these instructions for making improvised explosive devices, or IEDs as they are known in the security world, al-Qaeda's "chef" claims "the pressurized cooker is the most effective method." 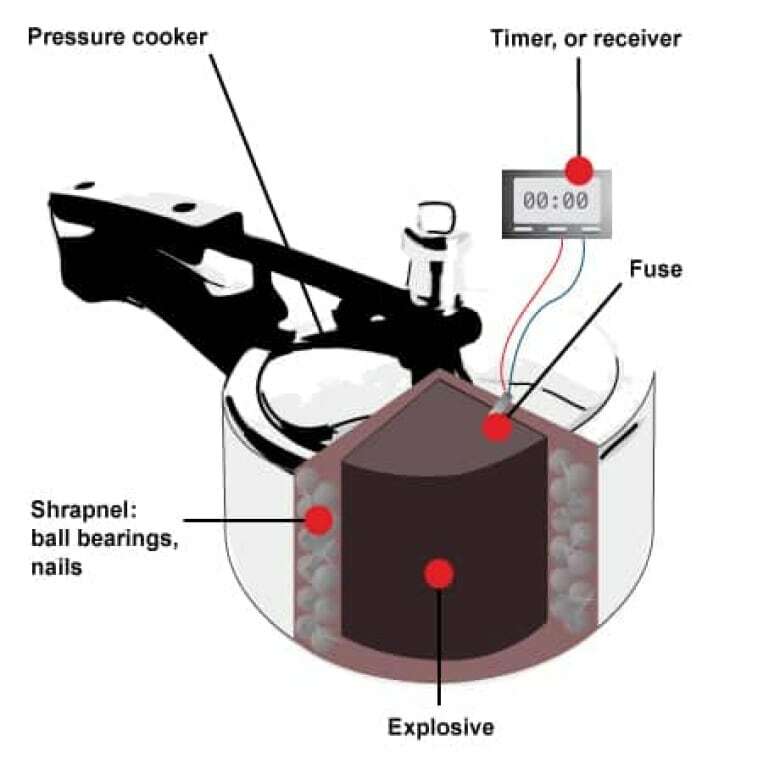 The bombs are made by placing an explosive material inside the pressure cooker. The al-Qaeda article recommends military-grade explosives like TNT, C4 or RDX. Information about pressure cooker bombs can also be found on white supremacist and anarchist websites. Former FBI agent Jack Cloonan told CBC that "domestic groups in the United States have used these types of devices." Cloonan, now a global security consultant, worked for six years in the FBI unit that hunted al-Qaeda chief Osama bin Laden. Cloonan said that the Boston attack had "a level of sophistication that was deadly, it was timed and positioned to go off in a rather sophisticated way." A blasting cap can be attached to the top of the pressure cooker. The explosion can be triggered using simple electronic components like digital watches, cellphones, pagers or garage door openers, according to the U.S. Department of Homeland Security. The DHS website says "pressure cooker bombs are made with readily available materials and can be as simple or as complex as the builder decides." In countries where pressure cookers are common, an advantage of using one for an IED is that it won't seem out of place. In 1976, New York City police officer Brian Murray was killed when a pressure cooker bomb he was attempting to deactivate exploded. The bomb had been placed in a locker in Grand Central Station by Croatian nationalists. In Boston, the bombs were probably hidden from view inside a black nylon backpack or duffel bag, Rick Deslauriers, the head of the FBI's Boston division, told a media briefing late Tuesday afternoon. "The bag would have been heavy because of the components believed to be in it," he said. Pieces of black nylon and fragments of BBs and nails have been recovered from the scene. Pressure cooker bombs also have been linked to recent planned or attempted attacks in the U.S.
Wires or fuses protruding from the cooker. Unusual smells, especially chemical odours. A cooker apparently abandoned in a high traffic or strategic location. In 2010, Faizal Shahzad, a 31-year-old Pakistani-American, attempted to bomb Times Square in New York. He had three explosive devices inside his SUV, including a pressure cooker bomb, but they failed to detonate. He was sentenced to life in prison. U.S. army private Naser Abdo, 21, was arrested in 2011 and charged with possession of an unregistered destructive device. Among items police seized from his hotel room were two pressure cookers, six bottles of smokeless gunpowder and a copy of "Make a bomb in the kitchen of your mom." Abdo apparently was planning to attack military personnel at Fort Hood, Texas. The pressure cooker bomb came into widespread use in the 1990s in Nepal's civil war, according to Foreign Policy magazine. Their use then spread to India, Pakistan and Afghanistan. One of the bloodiest incidents involving these devices was on July 11, 2006 in Mumbai, India. Seven bombs went off on commuter trains, killing 209 people and injuring 714 during the evening rush hour. More recently, in February, a pressure cooker bomb exploded inside a restaurant in northern Afghanistan, killing five people. French police have twice managed to prevent the use of pressure cooker bombs. Ten Islamic militants were convicted for planning to blow up a market in Strasbourg on New Year's Eve 2000. And during an investigation into a grenade attack on a kosher market in a Paris suburb on Sept. 19, 2012, police found bomb-making materials, including a pressure cooker, in an underground garage. They blamed a network of Muslim extremists. Police took seven suspects, all born in France, into custody.